Agoraphobic Nosebleed aren't the first grind band to experiment with doom in their sound – Pig Destroyer got there first with 2008's Natasha EP and Rotten Sound regularly include sludge elements on their albums – so perhaps this comes as less of a surprise than it should. Apparently part of a series of forthcoming EPs with each band member taking the lead for one, KISS-style, Arc is the brainchild of vocalist Kat. It's always interesting when bands change their sound so radically, particularly with grindcore, which here is taking its USP of short, sharp, shocks and reversing it; especially so with Agoraphobic Nosebleed, who were once known for their seconds-long, drum-machine backed bursts of sonic warfare. For them to do a 180 and wallow in the sort of sludgy riffs you'd usually find coming from NOLA legends like Crowbar is quite the change, and that they do it very well is a point in this band's favour. Just three songs are present, growing in length from opener Not a Daughter at seven minutes up to Gnaw at just under twelve, and as ever with sludgy doom, the longer the better. Not a Daughter is a solid opener however, groovy and oddly catchy in a Soilent Green sort of fashion, with a late-track switch into a swinging doom riff. Deathbed is a turn for the slower, almost funeral doom at moments, ending on a strange sample (which always seems to mean more for the band than the listener), while ending epic Gnaw has a weirdly industrial vibe thanks to the rhythmic percussion before finishing on a nice burst of ambience. I'd have preferred an even slower song that took in more drone elements and really pushed the boundaries, but what we have is more than good enough. 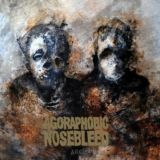 A good little EP from Agoraphobic Nosebleed.